How to plan the world’s biggest festival? 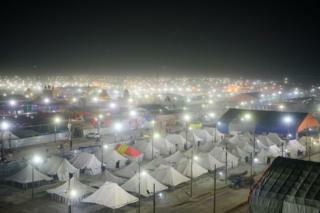 India’s Kumbh Mela festival is considered as the world’s biggest gathering of people. Between now and March organizers expect about 120 million pilgrims to bathe at the Sangam – the confluence of the Ganges, the Yamuna and the mythical Saraswati rivers. Hindus believe that doing so will cleanse them of their sins and help them attain “moksha”, setting them free from the cycle of birth and death. It is quite interesting to know how does organizers planned to conduct this huge event, where millions of people flock in one area. The mela (Hindi for fair) is held in the northern city of Allahabad (recently renamed Prayagraj) every 12 years. In 2001, when the first “mega mela” was concluded at Allahabad. On Tuesday, when the festival formally begins, officials are preparing for 15 to 20 million visitors. But the biggest test they face will be on 4 February when 30 million are expected to attend for the most auspicious bathing day. The festival ends on 4 March. This year’s festival is an “ardh Kumbh” – a “half-size” version that falls mid-way between two Kumbhs – but there’s nothing diminutive about it. In fact, it’s much bigger than the last full Kumbh held in 2013. All participants stayed in a vast tent city built on the mudflats of the river delta and thousands of officials are working round the clock to ensure the festival runs as smoothly as possible. “We’ve been working for more than a year,” senior administration official Rajeev Rai told BBC. This year, it is expected that 120 million people will attend the said festival, almost the total of population of Britain and Spain. Also, about 6,000 religious organizations will work closely to accommodate all the attendees, with a massive $397 million budget.